stock is to Go Long Above 20day EMA and short below 20 Day EMA. Which works well if you applies to the 6 month chart of RCOM. In the 6 month chart of RCOM it is clearly visible that short the stock if the candle exactly falls below 20 day EMA and go long if the candle is exactly above 20 day EMA. 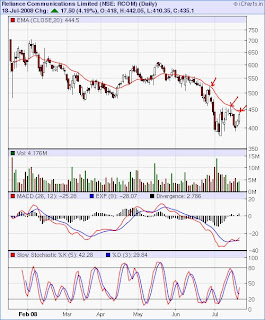 the stock is currently in oversold condition as per figures from Slow Stocastic Indicators. If you are are a Intraday player then it is good to go through the strategy before taking a trade in this counter. Bearishness is observed from the open interest figures. As per General rules of Volume and Open Interest "Rising prices and a decline in open interest at a rate greater than the seasonal norm is bearish. This market condition develops because short covering and not fundamental demand is fueling the rising price trend. In these circumstances money is flowing out of the market. Consequently, when the short covering has run its course, prices will decline. "